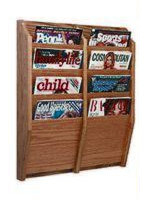 Dividers (20) for Tons of Storage! 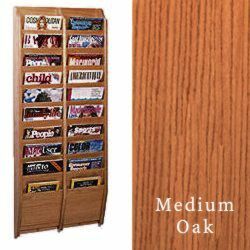 Medium Oak Finish for Any Setting! 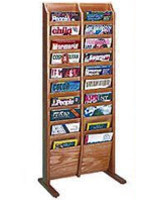 Wall-Attaching to Preserve Floor/Counter Space! 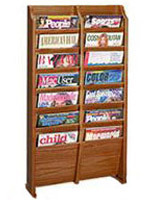 This 20-pocket office flyer rack, also known as an oak magazine stand, is one solid medium oak unit. 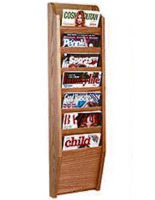 This dispenser of publications for business has two rocks of pockets to make pamphlets accessible. 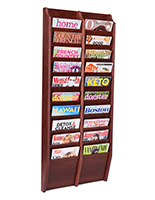 This catalog dispenser, 20-pocket office flyer rack conserves space on floors and tables. A literature display this attractive will put attention onto essential business documents to make sure they get read! 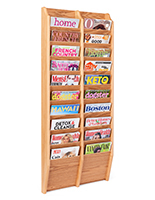 Buy 20-pocket office flyer racks for stores, libraries, and all manner of smart looking venues! 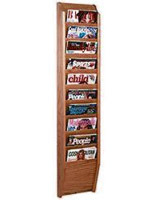 20.5" x 48.0" x 4.8"